The Olympic Games venues are moving towards energy efficiency programs, such as it happened at the 2012 London Olympics Games. Moving under this influence, we could talk about 2016 Rio de Janeiro, Olympic Games, and their Solar City Tower. The 2016 Olympics organizers have developed what could one of the most iconic buildings of any Olympic Games, a tower capable of generating energy by using a hybrid solar-water system, that will offer power to the Olympic Village and part of the city. It is definitely a landmark and iconic building for Brazil Summer Games. The Solar City Tower, an extraordinary structure that will raise hundreds of feet into the air, was designed by world-famous RAFAA Architectural firm. The Zurich-based design firm has designed a 105 meters tall structure that will function as a solar power generator during the day and will run as a​ ​hydropower generator and power storage unit at night. Solar City Tower will provide a spectacular show when ocean water will be pumped through the turbines, generating power and bringing an impressive waterfall effect, as amazing as any Vegas Show. Furthermore, it this amazing structure has not impressed you, then you must look it closer: by bungee jumping from the tower’s 90th floor, where a platform will be built to challenge all of those daredevils’ fans. The 2016 Olympic Games Iconic Tower will also have solar panels covering the outside of the tower, used to provide additional power to some of the Olympic Venues and the Olympic Village. Part of the energy produced by the solar panels will also be used to pump the seawater to the tower top. The solar city tower main attraction should be the waterfall, called by RAFAA a ‘symbol for the forces of nature,’ however, the structure will have an amphitheater, auditorium, shops and other attractive retailers. The 2016 Olympic Tower will provide additional observation decks, on different floors, offering stunning breathtaking Rio de Janeiro’s view. Long distance observation can be done from the observation deck on level +98.0. The urban balcony is situated at the top of the tower 105 meters above sea level. The designer thinks that by developing this towering structure, should serve as a game-changing strategy to redefine sustainable urban design. 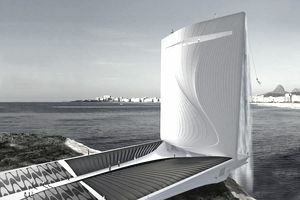 The Solar City Tower will be located in one of the islands in Guanabara Bay, able to offer the most dramatic Brazilian skyline views. This structure will be at par with the city's iconic Christ the Redeemer, a statue that resembles the Brazilian community around the world. The Solar City Tower could represent the nation's role as a green leader in the 21st century--all while contributing to it with its sustainable features. The Solar Tower has conceptualized after an architectural completion held by the 2016 Olympic Games Organizers. The structure will be located near the obligatory approach for aircraft landing and will comprise a vertical structure which will seek to become a symbol for those arriving in Rio de Janeiro. The Solar City Tower was an idea designed to provide a unique building for the 2016 Summer Olympics, but this project was not able to become realized due to multiple issues and problems. RAFAA design studio is located in Switzerland, is dedicated to deal with new techniques, inventions, and designs by research. The studio was founded by Rafael Schmidt in 2008, having an architectural master’s degree from ETH Zurich, and he has been working since 2001 for important firms such as Zaha Hadid and Foster & Partners. The collaboration with different artists such as photographers, composers or curators is a further key element. Some of the prestigious projects of RAFAA are Danish Dermatological Development, Frankfurt, Solar City Tower, Rio de Janeiro, Residence, Langstrasse, Zurich, New Bike Share System, Copenhagen, Memorial, Atlantic City, etc.